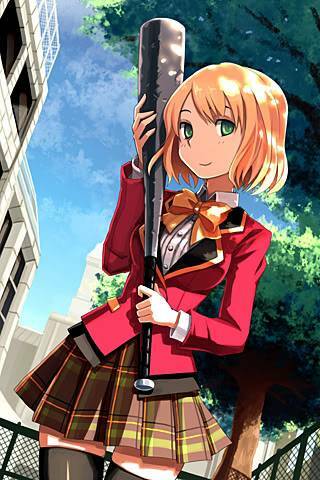 Weapons: Baseball Bat, as Magical Girl her weapon is a gladius. She also has a buckler shield. Magic: Linda's magic is determination based. The more opposition she faces the more determined and hard her strikes will be. When Linda transforms, her Magical Girl costume gives her leather and steel armour, with steel shoulder pads and steel chest armour which cups her upper chest however exposes her midriff. She also has a light leather armoured skirt with a belt on it and armoured boots that go up to her knees. Underneath are thighhighs. She also gains war paint in her face. Hobbies and Talents: Linda enjoys going outside and sports activities such as Baseball, at which she is decent. She also enjoys Squash and Badminton, anything that lets her hit something with a bat or similar. She is quite talented at hitting stuff. Linda also enjoys the occasional riding, which she does at a nearby farm that she has good connections to. 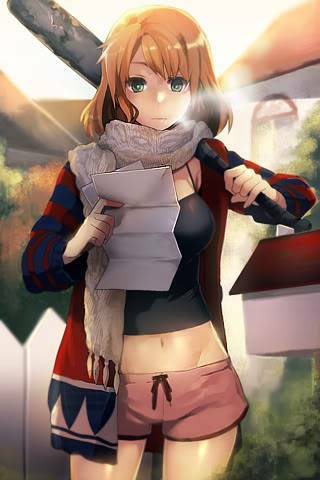 Camping also is one of the things she enjoys, and since she has found a lover to dedicate herself to, pleasing Raelyn has become a hobby she is talented at, having a lot of stamina. Wish: "I want to always have the strength to protect Raelyn and my friends, no matter how big, scary or vicious the enemy!"